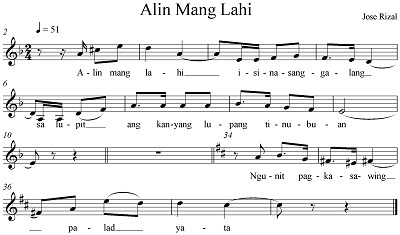 Among Jose Rizal’s musical compositions is the song Alin Mang Lahi (In Any Race). The lyrics of the song, also penned by Rizal, talk about the quest for freedom from oppression by foreign invaders, and the willingness to fight battles to restore freedom for one’s countrymen. Ng buhay at dugo kung kailangan. Lalong nagbibigay-hapis ang ibang kapwa. Ng alin mang lahing makasuno natin? Rubio, H.F. (1978). Songs for my people. Filipino heritage: the making of a nation, vol. 7. Lahing Pilipino Publishing.